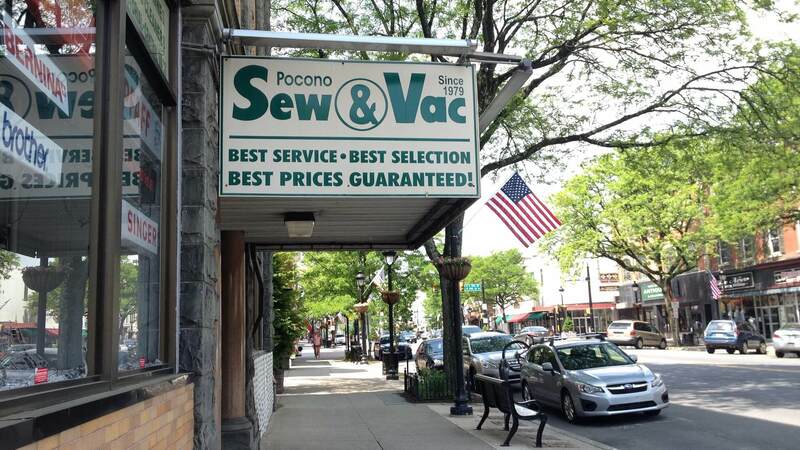 Pocono Sew & Vac has been serving our customers for over 37 years. From our humble beginnings in 1979 in a small storefront we have grown into our location on Main Street in lovely downtown Stroudsburg, in the heart of the beautiful Pocono Mountains. Our 7000 square foot facility boasts a large showroom with a tremendous array of demonstration machines that you can "test drive" and “try before you buy” with all types of fabrics. We also have over 5000 square feet of warehousing space, so we very rarely run out of anything and our customers can count on us to have what they need. With a staff of over 15 people, most with 30-40+ years of industry experience, working to provide the extensive knowledge and service that our customers have come to rely on. Our dedicated service department can also provide parts and repairs for all models of home sewing machines. One of the best in the country. Ask your friends about us. To augment our extensive machine line, we also carry a wide variety of sewing notions, accessories and computerized sewing software. As part of our continued efforts to serve the Quilters out there, we have expanded our fabric lines and carry approximately 3000 bolts at 20% off from the best designers. We also have a 40% off rack with up to 400 bolts, and our club members enjoy even greater savings. We have customers that travel from miles away to shop our vast fabric collection and we always have the best deals on sewing machines, everyday. We have also added 2 classrooms to our facility to accommodate our growing education department. Our expert teachers offer lessons and specialty classes designed to benefit beginners, as well as the most advanced sewer. We offer it all! We are an authorized sales, parts, software and service center for a vast line of manufacturers including: BERNINA, PFAFF, ELNA, JANOME, NEW HOME, HUSQVARNA/VIKING, SINGER, BABYLOCK, BROTHER, JUKI, HANDI-QUILTER and many others. Now, let’s talk vacuums. Our vacuum department offers the best names in cleaners: MIELE, SEBO, DYSON, PANASONIC, and ORECK as well as the largest selection of NuTone and Modern Day central vacuum systems in the area. We also carry an extensive inventory of bags, belts, and filters for most manufacturers' machines and specialize in the hard to find ones. Our service department has a vast stock of parts and an expert team to keep them running! We sell our sewing and vacuum products to all customers located within the lower contigious states. However, if you're close by, such as in a city below, stop by the store in person in downtown Stroudsburg!